I was drawn to this book because I heard such good things about and I just love the time period. It completely delivered. 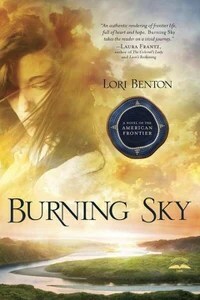 Burning Sky is a winning novel because it felt real and rooted in history while delivering fascinating characters that made you want to know more and more about them. Willa is a very strong female and one that I could appreciate. I will say she does have her moments that made me want to shake her a few times (this had to do with her romantic interest), but there is a reason for that and everything works out in the end. There are two possible male interests in this novel (which I’m not a fan of), but it does become pretty clear by the middle of the book as to which guy will win. The only sad part is that I liked them both and I almost hope that the guy who had to walk away gets his own book. I will say, that towards the end a lot kind of happens, but it’s nothing that the story has not already been building up to. Spiritually, all the (main) characters have a relationship with God that involves constant talking to Him and trusting Him. I felt that this was beautifully shown in their lives and it felt authentic. This novel is an absolute joy to read. Believe the hype. If you like Laura Frantz, you will thoroughly enjoy this novel. Previous Post Monday Musings…More Exciting Books to Look At!